After an incredibly fun trip to Nashville (except for the final score of the Music City bowl game), it was time to head to the airport so I could ring in the New Year in my hometown of Houston. Well, at least that was the plan. 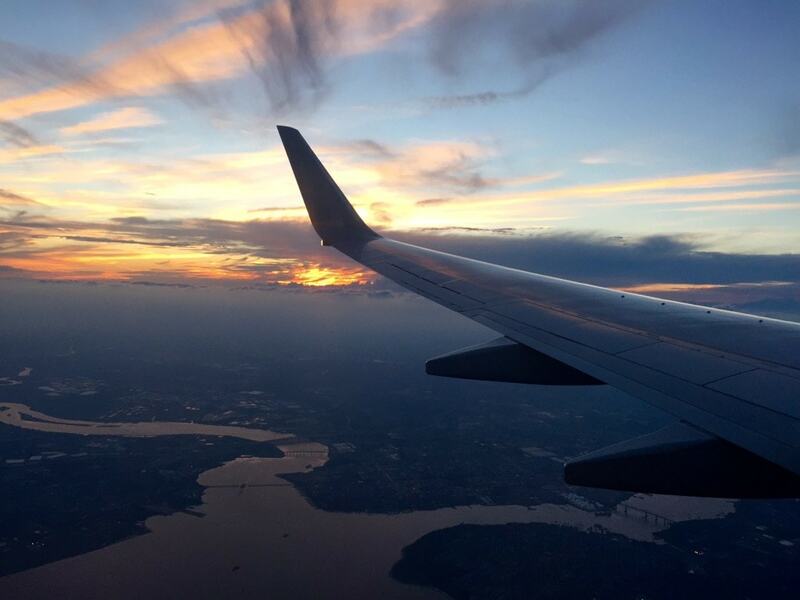 While my New Year’s Eve, may not have gone as planned, I did learn a valuable travel lesson about oversold flights that I thought I would share. My friend, Rebekah, had purchased her and her mom, Joni’s, tickets together, but only Rebekah received a seat assignment. Likewise, I also had the mysterious “see gate agent” listed on my ticket instead of a seat number. We arrived at the airport well in advance because I didn’t want a repeat of my harrowing experience running to make a 5:45 am flight to San Diego a few weeks prior. After going through security, Joni and I went to the gate to ask about getting seat assignments. The agent (who perhaps was very new to the gig) said that all seats were taken and he would have to wait until everyone checked in. He did let us know that the flight was oversold by two people. I told him that Rebekah and I were interested in what they would offer for us to give up our seats. Since this was well before the flight, they said they would offer $400 in flight vouchers. We had quite a bit of time before our flight, so I began researching compensation for being bumped off a flight. I found quite a bit of good information on oversold flights in the US. First of all, there is a difference between voluntary bumping and involuntary bumping. 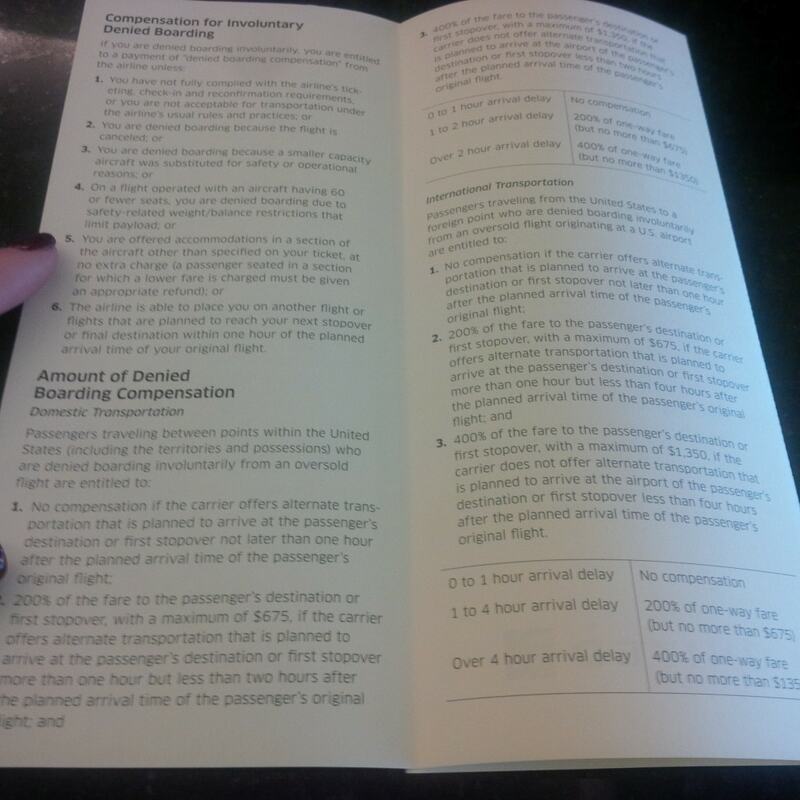 If you get bumped involuntarily you must (provided you meet a few basic requirements – see photo) be compensated four times the price of the one-way ticket up to $1350. Also, while you usually get a flight voucher if you voluntarily give up your seat, you receive an actual check if you are involuntarily bumped. In both cases, you may be entitled to vouchers for hotel, meals, and transportation. It depends on the length of time until your new flight and your negotiation skills. While waiting by the gate, only one request was made over the speaker for volunteers to give up their seats in exchange for compensation. As departure time crept up, I went back over to see if there were any updates. At this point, the United agent began looking at ways to reroute us home. He repeatedly stated that he could get us out of Nashville and to a hub, but could not get us to Houston. I did not want to be flying north and risk getting stuck in an airport due to weather. Eventually, they found us flights on American the next day with a four-hour layover in Dallas. They did not book these for us though because the flight had not completed boarding; however, they gave Rebekah forms to fill out to state that she was voluntarily giving up her seat. She completed the forms and signed the paperwork so that her mom could take her seat on the plane, but we retained all of the paperwork. (I’m pretty sure they were supposed to keep the document Rebekah signed). So the three of us waited by the gate as the other passengers boarded the plane. There was only one passenger missing. It looked like Joni would get that seat and Rebekah still had her assigned seat. At this point, I found my car keys and handed them to Rebekah as it appeared that I might be ringing in the New Year in Nashville by myself. Then Daeshon Hall, an Aggie football player, came up to the gate – he had run into a friend and had almost missed the flight. His arrival meant that two of us were not going to get a seat on the flight – so Rebekah and I made our way back to the United desk so that they could reticket us on the American flight the next day. Since Rebekah gave her seat up to her mom, she received the $400 travel voucher. Since I never had a seat to begin with, the gate agent told me that I was considered involuntarily bumped. (I am not sure that this is always the case though – I think, had I filled out paperwork similar to what Rebekah signed before the flight, I could have been considered a volunteer. The gate agent called the United hotline to find out how much I should be paid and then slowly wrote the check which had to be signed by two United employees. Since I was involuntarily bumped, I received a check for four times the amount of my one-way ticket the day of the flight. The entire “Involuntarily Denied Boarding” process is mandated by the US Department of Transportation. Paperwork Katherine received about compensation getting involuntarily denied boarding. At the same time, they were attempting to book us on the flight that they had previously located. My process was taking longer than Rebekah’s, so the gate agent helping her booked a hotel room with two beds at the nearby Comfort Suites. Since their shuttle was not operating, she also got two cab vouchers. I then asked for meal vouchers. We each received two $7 meal vouchers for use at select places in the airport. Not great – but I did end up with Diet Cokes, Doritos and sour patch kids – which make anything better! As we were wrapping up, I realized that the taxi vouchers could be used to get anywhere, so I asked if I could get two as well. My agent balked – he said that we already had the two we needed. I politely requested again, and a new gate agent agreed. I think she felt sorry for us that we were having to spend New Year’s Eve in Nashville. YOU MIGHT ALSO LIKE: The Parthenon - not the one you are thinking of! So after all this negotiation, we headed to the Comfort Suites. It was very close and the cab fare cost around $10. I used one of the vouchers and let him know that it was for $30, which meant he got the rest of the voucher amount as a tip. We used the remaining vouchers to get around that night. We had to explain to three of the four drivers that the balance of the voucher was the tip. It was a very good deal for them. 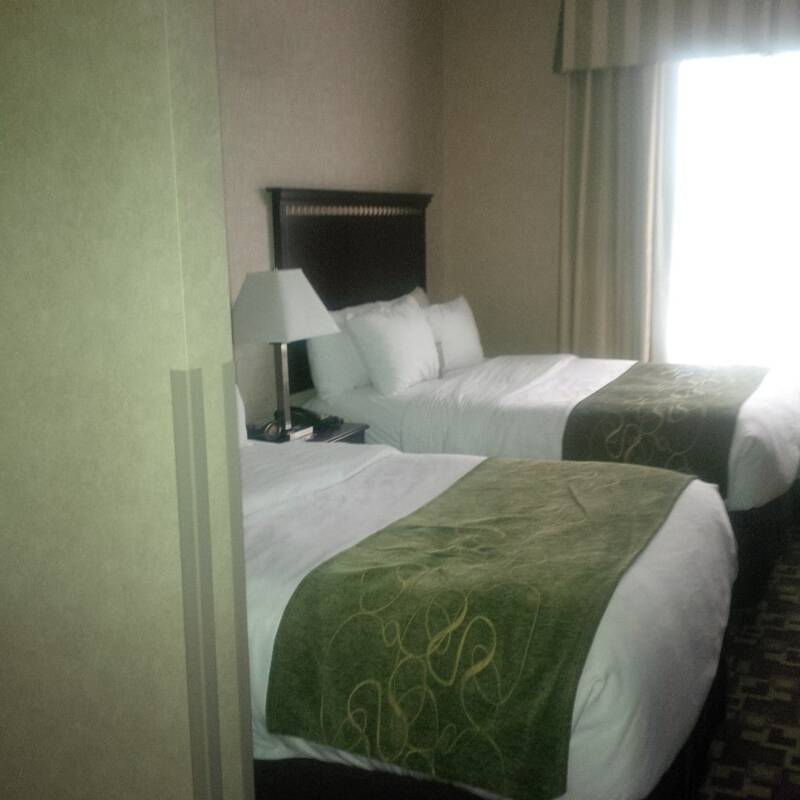 Our comped room at the Comfort Suites. We ended up having a fun day exploring Nashville and made the most of our long journey home. Yes, it wasn’t in our plans to be bumped, but United did pay us for it, and we got to see a bit more of Nashville. Have you ever been bumped from a flight? We would love to hear about your experience with oversold flights in the comments. If your boarding pass has no seat assignment and says “see agent,” your flight may be oversold. Know what to ask for if you are considering getting voluntarily bumped. Feel free to ask to get the same thing the last person receives, even if you are one of the first people to volunteer. Also ask for a hotel, meal vouchers, and transportation vouchers. Know your rights if you get involuntarily bumped from oversold flights. Make the most of the cards you are dealt – we had a fabulous extended vacation because we chose to have a positive attitude. Thanks Russell! That is very helpful information. You kept your cool and weren’t afraid to ask for what you wanted. Great. Not sure I’d have given up my NYE but as long as you were in Nashville and with friends it was a great adventure. Happy New Year! Exactly! We made the most of it. Happy new year to you too Elaine! I have never been bumped from a flight, but it sounds like you had a great time anyway. Yes, sometimes its not a bad thing to get bumped! Lyndall – Happy to share! Thanks for stopping by. Great information! I am almost always willing to be bumped, but it doesn’t seem to happen enough these days…darn! Corinne – Yes! Something’s never happen when you want it to! I imagine Nashville could be a fun place to be on New years. Certainly there are worse places to get struck! glad you were able to make the best of it. good information! Thanks Eileen! Glad you enjoyed the post. My daughter who was 8-yrs-old at the time got the “see agent” note on her boarding pass instead of a seat assignment. The rest of the family had seats. I wondered if they seriously thought they could bump a minor involuntarily and would the rest of us be considered voluntary if we chose to stay behind with her. In the end, other folks volunteered, so she was able to board with us. Michele – oh wow that is interesting. I’m glad others volunteered. There really should be a rule against that but not sure if there is. Rob – Very true! Thanks for stopping by.